This was my most action packed year to date. Despite being rather low in thunderstorms I managed to do my most intense storm chasing and countless photography shoots. This section features two extreme Winters, an epic Glenshane Pass blizzard, thunderstorms, thundersnow, funnel clouds and an adrenaline inducing multi vortex event which came close to a touch down. 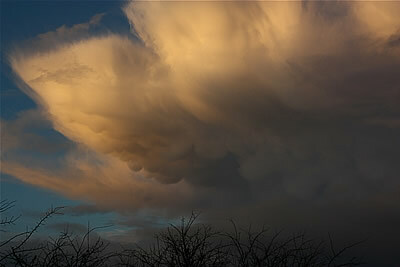 Also a great mammatus display, coastal night storms, NLCs, several mesocyclones, frozen rivers and Loughs. 17 image reports on here. 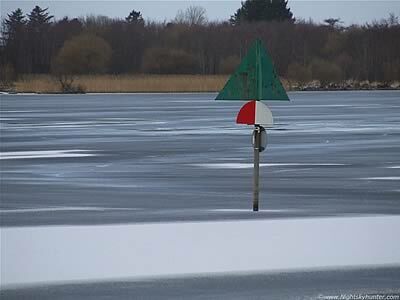 The second severe cold spell within a week making this the most extreme early Winter period on record. In N. Ireland we had the worst snowfall in 25 years and an emergency weather warning issued by the Met Office due to heavy snow showers, freezing fog, widespread ice and even thundersnow. Temps fell to a new Dec record of - 18 degrees C with day time temps at sub zero values. On Dec 19th 2010 I spent the afternoon near the Grillagh River outside Maghera photographing a remarkable formation of thick hoar frost the likes of which I have never seen before. One page report with 11 images. - REPORT. 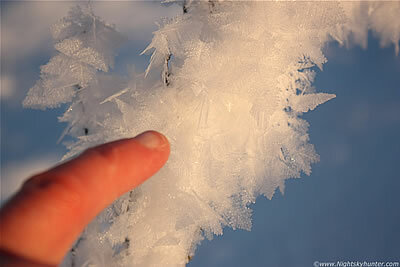 Third image report documenting day 14 of the severe Winter weather outbreak which affected much of Ireland and Britain. Dec 8th was the last significant day before a major thaw when I visited the NW shore of Lough Neagh at Ballyronan Marina where I was astonished to see that a large section of the Lough had completely frozen over with ice and snow for the second time within 11 months. This is quite exceptional since the last major freeze here pre 2010 was 50-60 years ago which indicates just how severe things have turned this year. One page report with 15 images. - REPORT. Severe Winter weather hit much of Ireland and UK during November generating unseasonal but intense snow showers, record breaking freezing temps, ice and snow accumulations, and travel disruption. 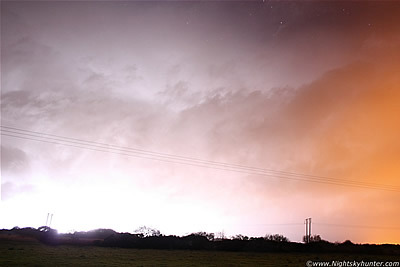 The highlight was six days and nights of thundersnow which lit up the sky over E Ireland. This report documents my experience with the epic November 26th and 27th all-night thundersnow display which I watched with awe from Glenshane Pass and Maghera some 60-70 miles from the storms themselves. 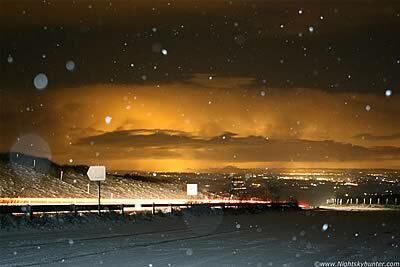 This was a magical night with bright stars, moonlit snow, and flashing thunderstorms. One page report with 14 images. - REPORT. November has been a very active month with no less than three Atlantic storms affecting many parts of Ireland and UK with severe gales, power failures, and flooding. Not much photogenic weather was observed until the 18th when after three days of dull skies and rain the sky cleared before sunset revealing a beautiful mammatus display under the anvil of a cell near Maghera sporting huge udders and dramatic cloud structure. One page report with 11 images. - REPORT. Amazing night spent at the north coast of Co. Antrim on November 1st and 2nd watching night time thunderstorms flashing over the dark Atlantic Ocean between N. Ireland and Scotland followed by a possible severe thunderstorm which tracked along the NW and N coastal regions putting on a stunning lightning show with c-g and I-c bolts lighting up the night sky like day time while most of the country slept. This night may have produced one or even two supercell storms in that area. This report documents my 6 hour drive chasing the spectacular show making this my longest and most thrilling solo chase to date. Unfortunately this was not an image success but more of a memorable visual experience so this report mostly contains words. One page report with 11 images. - REPORT. 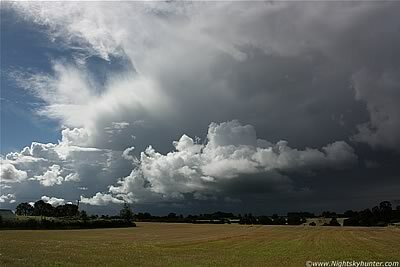 I had a great chase on Tuesday October 5th 2010 when I intercepted an organised long-lived thunderstorm in a highly sheared environment outside Coagh. The storm produced c-g lightning, loud thunder, and intense rain/hail with gusty winds as it passed through into the direction of Antrim. 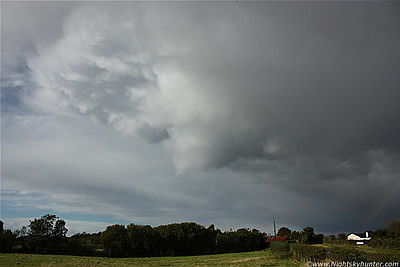 I chased after it and got treated to a small but well defined funnel cloud which rotated for 5 min's between Ballyronan and Toome accompanied by mammatus and double rainbow!. The lightning also blew a hole in the roof of a house in Newry, Co. Down that same afternoon. A very successful and rewarding chase day. One page report with 13 images and 1 video clip. - REPORT. 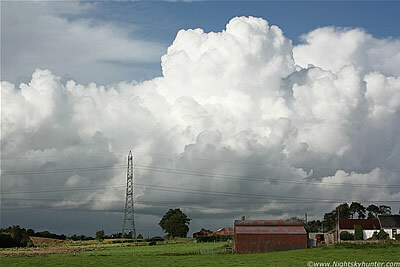 Summer of 2010 ended with a bang when active thunderstorms broke out over many parts of N. Ireland on Sept 22nd. I spent the entire day chasing in Maghera, Lavy, Toome, Magherafelt, Castledawson, Ballyronan and had a great view of countless high quality cells, on occasion 3 or 4 at a time which made decision making difficult. Strong inflow motion and rotation was also observed, there was even a brief night storm. Content includes a storm over Lough Neagh and distance cells while on the road, a possible small funnel cloud, and converging cells near Maghera. One page report with 17 images. - REPORT. A 'various' account featuring images taken between Aug 21st and Sept 16th 2010 covering numerous local storm chases, heavy convective showers, flooding, rainbows, Moonbows, Moondogs, and even an encounter with an irate farmer. One page report with 14 images and 4 video clips including a 2007-2010 image highlight slide show featuring three years worth of storms, cool clouds, Moonbows, NLCs, Auroras, floods, snow, blizzards, and various day/night optical phenomena. - REPORT. The 2010 Noctilucent Cloud season was a rather disappointing show this year however several nights do stand out as being exceptional. 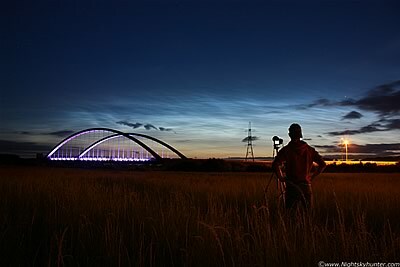 The highlight was the night of June 16th which produced the finest display of the Summer when Conor McDonald and I did an all-night photo shoot capturing a type 4.5 electric blue NLC display glowing above the famous illuminated Toome Bridge over the River Bann. This was a night of high photogenic reward and a majestic experience which I shall never forget. One page report with 11 images and one slide show. - REPORT. August 18th was an interesting day despite several atmospheric handicaps such as CIN, lack of convergence, and wind shear. Despite this, 600-800 CAPE and LIs of -3 made for an active day in response to solar heating and a trough crossing the country which produced thunderstorms across central and E areas of N. Ireland. Declan O'Doherty and I spent the day chasing from Maghera to Ardboe on the W side of Lough Neagh and intercepted 3 storms which produced 14 rumbles of thunder in the local area which made for a fun and successful chase. One page report with 10 images. - REPORT. 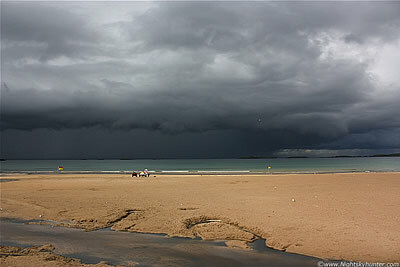 On August 9th 2010 I chased a huge multicell thunderstorm located over the Atlantic Ocean near Portrush, Co. Antrim during the late afternoon. The cell was so large that its main updraught tower could be seen all the way from back home in Maghera. Interception took place at White Rocks beach where I watched a nasty gust front approach the beach with intense precip core which produced 5 c-g bolts over the Sea. This was followed by another storm with the remainder of the evening spent chasing along the N coast watching large convection/cells exploding over the water. The day ended with dramatic storm clouds moving inland at Portballintrae making this a very successful chase as these where the only storms to fire in NI this day. One page report with 21 images and 1 video clip. - REPORT. On Wed July 21st major thunderstorms broke out across the E side of N. Ireland in response to high instability, multiple convergence zones, and a trough. 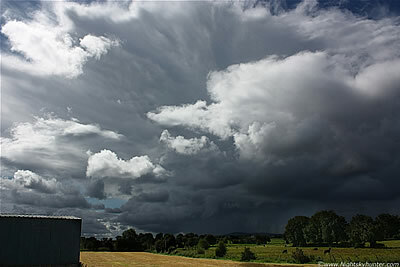 I spent the day chasing to the NE of Lough Neagh in Co. Antrim where I intercepted three thunderstorms. The highlight was watching a convergence line of the biggest and most explosive convection of the year including a beautiful photogenic line of cells over the Antrim countryside with the highest cloud tops I have seen since 2009. This was a great visual and photogenic day with torrential rain, hail, flooding, and booming thunder. Two page report with 20 images and 1 video clip. - PAGE 1, PAGE 2. 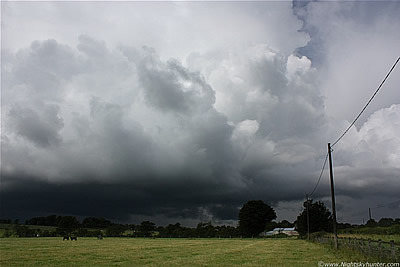 On July 14th and 15th the best thunderstorms of the year broke out across Ireland/N. Ireland in a very unstable airmass. The results were hundreds of c-gs and funnel clouds. Unfortunately we busted badly on both days and missed the main storms, however it was not all bad. On the 14th we got treated to our most explosive convection of the year so far followed by night t-storms from the N coast and an outflow boundary, booming thunder, and torrential rain on the 15th. This report documents both days. One page report with 18 images and 1 video clip. - REPORT. June 5th turned out to be our very best storm chase of the year to date. Despite being a low CAPE day there was significant convergence, moisture, and shear to develop isolated strong convection over N. Ireland. 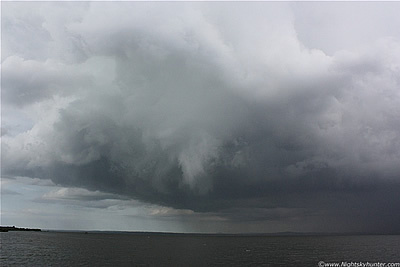 During the evening Conor McDonald and I chased and intercepted a massive thunderstorm with a Mesocyclone (rotating updraught) over Lough Neagh which was rotating for over 1 hour with numerous lowerings and funnel spin-ups. We had a perfect view from the Lough shore at the Battery Harbour where we experienced our best storm structure of the year!. Two page report with 25 images and 1 video clip. - PAGE 1, PAGE 2. 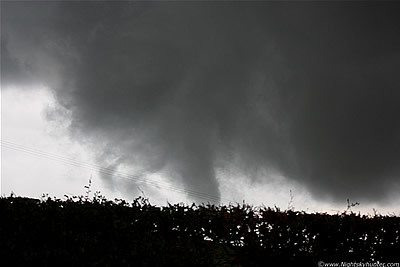 One of the best severe weather events I've experienced in N. Ireland so far. 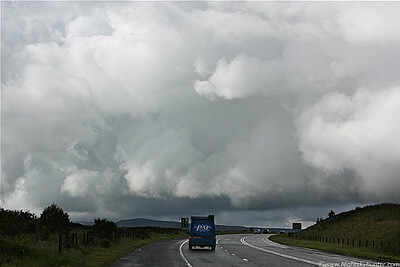 On Thursday April 29th 2010 Conor McDonald and I independently experienced a multi vortex funnel/tornadic event from the rear of a large cell which arrived over the Sperrin Mountains and moved eastward across the Maghera countryside. The cell produced three areas of simultaneous violently rotating vortices which passed me at close range lasting for over 20 min's in duration. This was spectacular since no convective forecast had been issued. Two page image account with 18 images and 1 video clip - PAGE 1, PAGE 2. 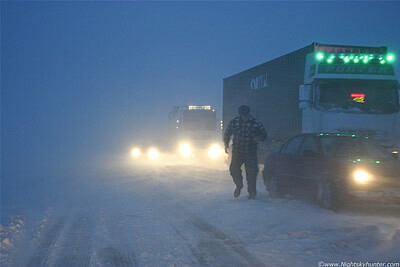 An extreme snow storm hit N. Ireland on March 30th/31st 2010 when an Atlantic low encountered polar air from the north which produced an epic snow storm over the Glenshane Pass where motorists experienced gale force winds, blizzards, white-outs, -30 C temps, ice storms, and huge snowdrifts. Over 300 people where trapped on this famous Pass where a rescue operation insued while thousands of homes went without electricity. This account covers the 48hrs centred on the main event when Conor McDonald and I experienced our most extreme Winter weather to date. Two page report with 27 images and 2 video clips - PAGE 1, PAGE 2. The UK/Ireland Winter of 2009/2010 has been the most severe in decades. Thanks to frigid air from the Arctic then Siberia we ended up getting almost three weeks of nasty Winter weather in the form of snow, sleet, freezing rain, freezing fog, ice days with sub zero temps, and nights which dropped to a phenomenal - 20 C. As a result many of the Rivers and Lakes in the country froze over for the first time in my life. 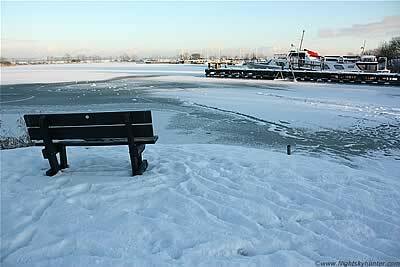 On Sunday Jan 10th 2010 I spent the day documenting the extreme freeze over a large section of Lough Neagh at Ballyronan Marina, N. Ireland which fast became the climax of this extreme event for me. Report with 25 images and 2 video clips - PAGE 1, PAGE 2.